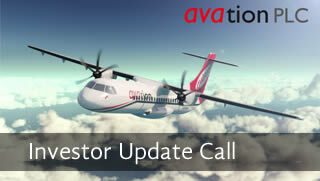 On 21 February 2019, the company hosted a conference call to discuss the Company’s first half year results for the 2019 financial year. Please click here to access the archived webcast. Passing through Singapore? Come visit us at our headquarters, we are always happy to see shareholders. Call us on +65 6252 2077 to arrange your visit today. The ordinary shares of Avation PLC are admitted to a standard listing on the official list of the London Stock Exchange PLC, ("LSE"). More information about the LSE can be found at www.londonstockexchange.com. Our symbol is AVAP, SEDOL is B196F55 and ISIN number is GB00B196F554. Shareholders can obtain information about their individual holdings from the Share Registrar, Computershare Investor Services PLC.